Any idea what may be causing this? If the output isn't too long, you can paste the result in here. Please use the little </> button at the top of the posting box to format what you paste (keeps the forum software from garbling it!). If the output is too long to paste in here, please share it online somewhere else and post a link. I don't have all the info you requested, but here is a screenshot from this morning. [Snip20180525_1] The x error from RStudio is: unexpected token '' This is a file that was on my Desktop, so no network drives were involved. When I view the characters in terminal using a more command, here is how they appear: ^@^@^@^@^@^@^@^@ Running the code works with no errors caused by the pink dots. So, the problem is one of annoyance and confusion about the code having errors. "Windows" ">= 8 x64" "build 9200" "DESKTOP-QJILMRV" "x86-64" "shill" "shill" "shill"
Does this happen with all types of files (.R, .Rmd, .txt), or only certain types of files — or only certain individual files? Can you post a file that displays this behavior somewhere (e.g. Google Drive, Pastebin, etc) and link to it? This happens only with this one .Rmd file, but the other files can be painfully slow. I did a Microsoft memory scan/optimization and this seemed to do nothing. This all seemed to begin when I upgraded to the newest Rstudio version. GPU process was unable to boot: GPU access is disabled through commandline switch --disable-gpu. Those pink dots are used as replacement characters for data in the document that couldn't be decoded -- in other words, it's typically a sign that the document has become corrupted and replaced with garbage data. If it only occurs for one file, then it would seem that one file somehow became corrupted -- your best bet would be to restore from backup. 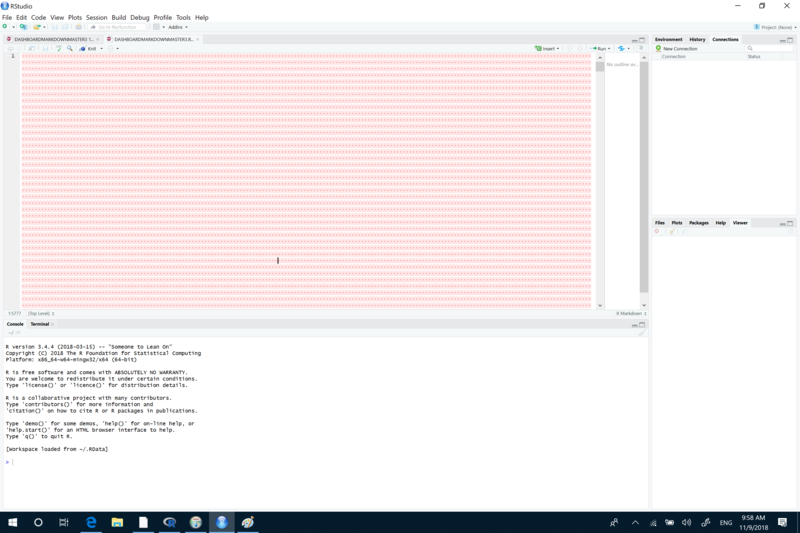 So had to stop a random forest model (ranger using caret) that had been running for 17 hours on parallel (expected time duration was 2-3 hours based on similar models) and when the CPU usage didn't go down after having stopped the process, I decided to close RStudio and shut down my computer. Now when I open the R project in question, every rmarkdown file within the project opens up looking like this. All the R scripts seem ok.